Q: Vice Premier Wang Yang of the State Council just concluded his official visit to the Philippines, during which the two sides reached a series of business and trade cooperation agreements. How do you comment on Vice Premier Wang Yang's visit? A: This visit, the first of its kind paid by a Chinese leader since China-Philippines relations realized a comprehensive turn-around last year, was meant to implement the important consensus reached between the Presidents of the two countries, elevate comprehensive and practical cooperation between the two sides, and advance the development of a sustained and in-depth development of bilateral relationship. During his visit, Vice Premier Wang Yang met with President Duterte, held talks with the economic management team of the cabinet of the Philippines, addressed the opening ceremony of the China-ASEAN Year of Tourism where he read congratulatory messages from Premier Li Keqiang, and delivered a keynote speech at the plenary session of the China-Philippines Economic and Trade Forum and the Investment and Trade Fair of Small and Medium-sized enterprises. He also made trips to the sites of such infrastructure projects as the port and airport of the Davao city. The Philippine side attached high importance to his visit and received the visit with warm hospitality. The two sides reached important consensus and outcomes on deepening bilateral cooperation in trade and investment, infrastructure, agriculture, and tourism, which provided a strong boost to the sustained improvement of China-Philippines relations. This visit was a full success. The Philippines is a traditional friendly close neighbor of China. 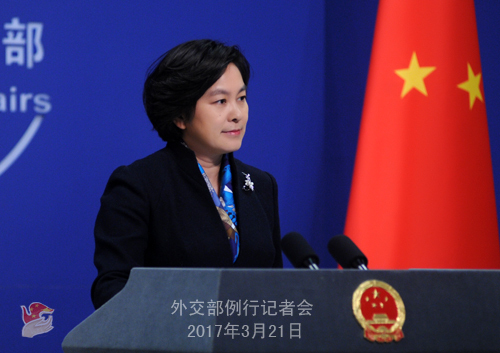 China attaches high importance to the China-Philippines relationship. The two countries have a high level of consensus on adhering to good neighborliness and friendship and strengthening all-around cooperation. Going forward, China would like to work with the Philippines to further implement the important consensus reached between the two Presidents, enhance political mutual trust, deepen comprehensive cooperation, and speed up common development so as to benefit the two peoples and promote regional peace and stability. Q: According to reports, the Trump administration said that it was considering more sanctions on the DPRK to cut it from the global financial system. What is your response to that? A: The situation on the Korean Peninsula is very tense, almost approaching a tipping point. This is not in line with the interests of any side. During his meeting with Secretary of State Tillerson and when attending the China Development Forum, Foreign Minister Wang Yi elaborated on China's positions clearly. At the current stage, the Peninsula situation is at another crossroads where are two prospects. One is that the relevant parties could continue with their assertive and escalatory moves, leading to conflict or even potential war. The other choice is that all sides can cool down and jointly pull the Korean nuclear issue back to a path of political and diplomatic resolution. Within the framework of the Six-Party Talks, positive and important progress had been made on the issue. In the September 19 Joint Statement reached in 2005, the DPRK for the first time promised to abandon all its nuclear weapons and existing nuclear programs. It served as a roadmap for politically resolving the Korean nuclear issue in a gradual way. Considering the current circumstance, any level-headed mind will not find it difficult to choose a more promising and more practical and viable path forward. Foreign Minister Wang Yi said that any chance of dialogue must be seized and any hope for peace must not be given up. 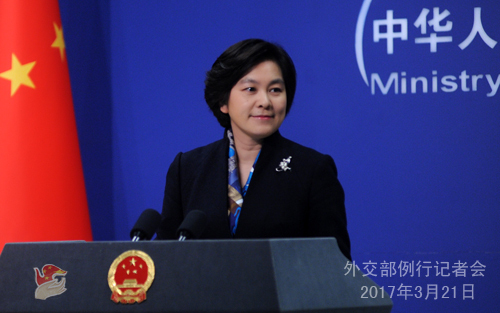 In order to alleviate tensions, China proposed a "dual-track approach" to promote denuclearization of the Peninsula and establish a peace mechanism in parallel and a "suspension for suspension". We hope that all parties give serious considerations to our proposal, calm down, work together to find a path out of the current crisis and transform crisis into opportunity, and jointly pull the Korean nuclear issue back to the right track of peaceful resolution through dialogue and consultation. This serves the common interests of all parties. I also want to add that China has been comprehensively and strictly implementing DPRK-related resolutions passed by the UN Security Council. While levying sanctions is a way of implementing resolutions, considering that relevant resolutions also call for a resumption of the Six-Party Talks, we believe promoting talks is a way of implementing resolutions as well. Q: Indonesian police said that the Interpol has issued "red notice" on three Chinese executives suspected of fraud, saying that they are connected with a Sinopec project in Indonesia. What is your comment? A: I have seen relevant reports, but I am not aware of the details. Q: Recently, there have been more complaints from people living in China's neighboring countries such as the ROK and Japan about China's air pollution spreading to their countries. Do you have a comment on this? Is China in talks with these governments? A: Air pollution is indeed an issue that the Chinese government is sparing no effort to deal with. 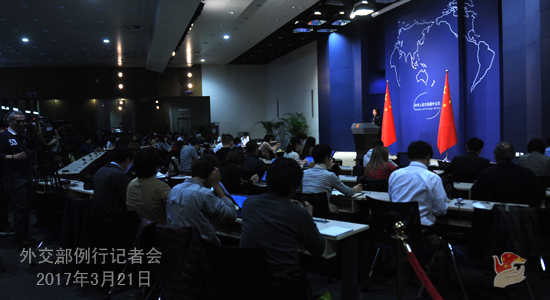 When Premier Li Keqiang met with the press after the two sessions concluded, he talked about the position of the Chinese government on this issue. The Chinese government is resolute in losing no time to make the sky clearer and the air cleaner. However, this would be a process that takes time. As to whether China's air pollution affects neighboring countries, it needs scientific and professional study and analysis. I suggest you check with China's environmental protection authority. As far as I know, China's environmental protection agency remains in close touch with other countries, including our neighbors. We would like to enhance international dialogue and cooperation on the environmental protection front and strive for greater and faster progress in environmental protection and governance. Q: Today, China's official Belt and Road website went online. Could you confirm which foreign leaders will attend the forum next May? A: Thank you for your interest in the Belt and Road Forum for International Cooperation (BRF). The BRF, which will be held in Beijing in May, is an important cooperation platform for stronger international cooperation and better alignment of development strategies. The BRF consists of two parts, namely a roundtable summit and high-level meetings. So far, 20-plus foreign leaders, 50-plus representatives from international organizations, 100-plus ministerial officials have confirmed their attendance. A total of more than 1200 delegates from various countries and regions will also be present. This shows the importance and support the international community attaches to the BRF and the Belt and Road Initiative. Preparatory work for the BRF is well underway, and the official website also went online. We will continue to make relevant preparations in an orderly fashion. As for which foreign leaders will attend the forum, we will release relevant information in due course. Q: Brazilian police found in their last Friday's large-scale campaign on meat products that low-quality meat was sold on the domestic market and exported. China is a major importer of Brazilian meat products. Has China been in touch with the Brazilian side? What measures will China take? A: China is concerned about the quality issue surrounding some meat products from Brazil. After confirming with relevant departments, we have learnt that the competent authorities in China have taken preventive and provisional measures of protection to ensure the safety of Chinese consumers. We hope that the Brazilian side can thoroughly investigate into this issue with openness and transparency, timely inform China of the latest investigation results, and take stricter measures to ensure food safety of products exported to China. China and Brazil are each other's major trading partner. We hope that we can enhance communication and coordination in the spirit of equality and mutual benefit, properly handle problems that occur amid cooperation, and jointly maintain the sound and steady development of China-Brazil business and trade cooperation. Q: Is there a limit to China's suspension on its imports of Brazilian meat? When will it be lifted? If Brazil cannot address China's concerns, will China find other alternative sources of meat imports? A: It should not be me to answer whether there is a limit or not. All I can tell you is that the competent authorities in China have taken preventive and tentative measures of protection to ensure the safety of Chinese consumers. We hope that the Brazilian side can thoroughly investigate into this issue with openness and transparency, timely inform China of the latest investigation results, and take stricter measures to ensure food safety of products exported to China. I also said just now that China values its cooperation with Brazil. We hope that the two sides follow the spirit of equality and mutual benefit and properly handle the problems arising amid cooperation through timely and effective communication. We hope that through having smooth communication between the two sides and with Brazil's responsible and strict measures, this issue will be resolved at an early date.